Turkish Foreign Minister Davutoglu Ahmet Davutoglu warned Wednesday in Tehran against a Sunni-Shiite civil war in the Middle East, which he said was being encouraged by some (unnamed) forces. Among the flashpoints in the area has been the confrontation between Iran and the United States at the mouth of the Persian Gulf. Iran conducted a 10-day military exercise there, warning of its ability to close off the waterway to world trade, thus depriving it of one-sixth of petroleum supplies. But an unstated element in this Iran-US confrontation is the US backing for Saudi Arabia and Bahrain, both Sunni powers, against Iran. 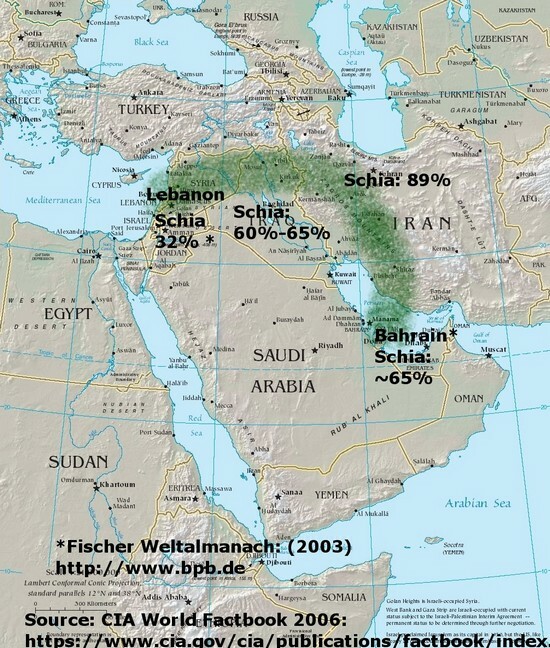 Bahrain’s citizen population is 58% Shiite, after tens of thousands of Saudis, Pakistanis and other Sunnis were granted citizenship by the Sunni monarch of the islands. The Bahrain monarchy has cracked down hard on the protest movement seeking a constitutional monarchy. Saudi Arabia sent 1,000 troops to help the Bahrain king, Sheikh Hamad b. Isa Al Khalifah. The United States has a naval base in Manama that serves as the HQ of the Fifth Fleet, which is charged with keeping the oil flowing from the Persian Gulf. This weekend, there were rallies against the Bahrain government in the Shiite hinterland, and one woman was killed by a teargas cannister. Turkish Foreign Minister Davutoglu got where he is by advocating a policy in Turkey of “good relations with neighbors.” It was this policy that doubled Turkish trade with the Middle East after 2002, and which led to the reemergence of Turkey as an influential country in the region, after long decades in which it had turned almost exclusively toward Europe. Turkey is a Sunni-majority country and the current Justice and Development Party government has strong Sunni Muslim constituencies, including the Naqshbandi Sufi order, which is important in Iraq and Syria. But the government has striven, despite significant tensions, for correct relations with Iran. Turkey imports natural gas from Iran and the two countries did more than $15 billion in trade with one another in 2011, up 55% over the previous year. Turkey, like South Korea, is seeking an exemption from upcoming US sanctions on sales of petroleum and gas via Iran’s central bank. Its Halkbank handles India’s purchase of Iranian petroleum. Sunni-Shiite tensions have flared in Iraq. On Wednesday, a series of bombs went off in Shiite neighborhoods of Baghdad, killing 23 persons; the bombers clearly want to reignite Iraq’s sectarian civil war. At the same time, a political crisis continues to unfold. Shiite Prime Minister Nouri al-Maliki accused Sunni vice president Tariq al-Hashimi of involvement in terrorist attacks, one of them aiming to assassinate al-Maliki itself. Al-Hashimi fled to Kurdistan and sought to have any legal proceedings against him take place there. An Iraqi court has instead ordered him to Baghdad. He is likely to flee the country rather than face al-Maliki- appointed judges. Al-Maliki’s charges against Hashimi have caused the largely Sunni Iraqiya Party to suspend its participation in his government of national unity. Al-Maliki blames Saudi influence for Sunni Arab violence against Shiites in Iraq. There is also a latent Sunni-Shiite dimension to the ongoing crisis in Syria. On Wednesday, some 26 persons died across the country as security forces continued to snipe at demonstrators. Some 19 of those deaths occurred in Homs, where there were big anti-government rallies. The ruling Baath Party is dominated at its upper echelons by members of the heterodox Shiite sect of the Allawites, whereas most of the urban centers that have come out against the regime are Sunni in character, and the Muslim Brotherhood plays a significant role in organizing them. Turkey has taken a strong stand against government repression of the demonstrators, and has come out strongly against the Allawite president Bashar al-Asad. The Justice and Development Party’s Sunni constituencies in Anatolia may be among the drivers of this stance in favor of the Syrian National Council. It represents and about-face; the party came to power in 2002 determined to repair relations with Damascus, in which objective it largely had succeeded before last spring’s uprising. Turkey had done some $2 bn. a year in trade with Syria and was working on a free trade zone with Lebanon, Syria and Jordan. Davutoglu is likely attempting to mediate between the US and Saudi Arabia on the one hand and Iran on the other. Unlike the former, Turkey is not spoiling for a fight. Davutoglu’s brilliant strategy of expanding trade with the Middle East has been deeply inconvenienced by the troubles in Syria and Iraq. Turkey’s truck trade with the Arab world went through Syria. Al-Arabiya reports in Arabic that Turkey is planning to ship the trucks to the Egyptian port of Alexandria, from which they can take their goods anywhere in the Arab world. But the shipping costs will obviously reduce profits. Turkish trade policy, which depends on harmonious relations among neighbors, impels it to attempt to tamp down sectarian conflict. Iran and Saudi Arabia, as oil states, do not absolutely require regional trade for their prosperity, and so they have the independence to conduct a struggle with one another if they (unwisely) so choose. Whatever Davutoglu’s specific mission, which has not been revealed, his general emphasis on tamping down tensions couldn’t be more essential.